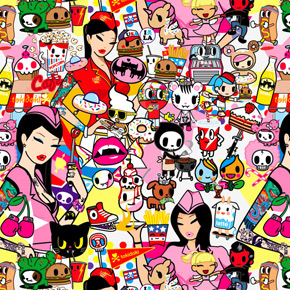 Mischief abounds in the magical world of tokidoki, where one glance is never enough. Creator and Italian artist Simone Legno brings his cult-favorite designs and colorful interpretation of life to a new makeup and accessories line that exposes the criminally cute and irresistibly edgy sides of beauty. Presented exclusively at Sephora, this Japanese-inspired collection captures the true spirit of tokidoki: Every day brings another opportunity to dream. To Sandy and her friends, the cactus is a sign of protection, while kids are naïve, vulnerable, and in need of protection. The Cactus Friends zip themselves into cactus suits as armor against a cold and scary world. The cactus is the conserver of water, and water means life. To Simone, the Cactus Friends represent life: Fragile and strong at the same time, yet pure like water. Adios spent 500 years in fire and brimstone before the Devil discovered his good-natured ways and kicked him out of Hell. Too mischievous for Heaven, Adios was condemned to live forever on earth in a modern grave-loft with his girlfriend Ciao Ciao and their cat Skeletrino. Together, they wander the world, sharing with others how to make the most out of this life. Mozzarella leads the Moofia, a gang assembled to extort milk from the lunchboxes of schoolyard bullies. Mozzarella and the Moofia are loving and kind to good kids, but ruthless and feared by those who harass the innocent. By taking milk from the bad and giving it to the good, they know the good will grow up strong and healthy to protect themselves. To the Moofia, milk is power and protection. CHECK OUT MORE TOKIDOKI CHARACTERS FROM THEIR WEBSITE.